If you have been addicted to alcohol or drugs, it is a great achievement to break away from these substances. Taking this step should mean that your life improves, but it may not be enough to guarantee a good life in recovery. This is because achieving physical sobriety only gets you back to where you were prior to falling into addiction. In order to find real happiness going forward, you need to develop emotional sobriety as well as physical sobriety. 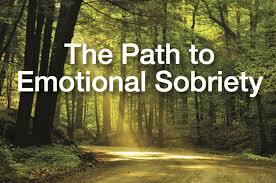 Emotional sobriety means that you have a high degree of control over your emotions. This is important because it is this inability to handle emotions that is usually responsible for driving people into addiction in the first place. If you become sober, but still struggle with your emotions, it will mean that you will continue to feel great discomfort. The way most people respond to this type of emotional discomfort is to either relapse or turn to new maladaptive behaviours. They will not be prone to excess worry. They will enjoy a significant amount of serenity in their life. The emotionally sober individual finds it easy to live in the present moment; they are not full of guilt about the past or worried about the future. They will get pleasure from seeing other people do well. They are not prone to intense emotions such as anger. They will be highly skilled when it comes to regulating his or her own behaviour. This means they are unlikely to turn to maladaptive coping strategies to help them escape life. They will enjoy a good level of calm no matter what is happening in their life. They have an optimistic view of the future. As people develop emotional sobriety, they begin to think more about the needs of others. They have many friends and find it easy to make new friends. Pessimism about the future and guilt about the past. Believing they have a very high level of stress in their life, and feeling overwhelmed because of it. Prone to extreme mood swings; the dry drunk easily becomes angry and resentful. When there is any uncertainty (basically, most of the time), the dry drunk just assumes that the worst possible result will occur. Struggling to regulate their own behaviour, meaning that they are at high risk of relapse or turning to new maladaptive behaviours. Experiencing an almost constant level of unease in their life – even when things are going well, they do not experience much comfort. Finding it hard to make new friends and maybe alienating family and old friends. Being self-obsessed, meaning that they are only interested in what other people can do for them. Getting pleasure from watching other people fail, which makes them feel less bad about their own failure in life. Life in recovery can be a very bumpy ride if you do not have at least some level of emotional sobriety. You will have been using alcohol or drugs to help you cope with life, so you now need something to replace these chemicals. Emotional sobriety gives you the tools for dealing with the vicissitudes of life, but if you do not have this then you are likely to turn to maladaptive coping strategies (for example, you become a workaholic or exercise addict). If you do not have emotional sobriety, it can mean that recovery begins to feel like a prison sentence; you will end up enduing recovery rather than enjoying it. It is also going to mean that you are likely to experience symptoms of depression. Developing emotional sobriety is necessary if you want to find happiness away from alcohol and drugs. Life is the best teacher in the world and the best way to develop emotional sobriety is to face life on life’s terms. If you are willing to deal with the challenges that come your way in life, it is going to force you into a position where you have to learn how to cope. It is best to think of each of these challenges as being like a puzzle, and once you have solved the puzzle you will have gained a valuable piece of knowledge. This means that when you face a similar challenge in the future, you will already know how to deal with it. One of the reasons why people who fall into addiction lack emotional intelligence is because they refuse to face the challenges of life. The fact that they try to hide from their problems with the help of alcohol or drugs means they never develop the knowledge they need to actually deal with the challenges that come their way. It can be helpful to think of emotional intelligence as being similar to a toolbox that you fill up with coping strategies. Every time you manage to get beyond a new challenge it means that you get to add a new coping tool to your toolbox. Eventually you can reach a stage where you have so many tools for dealing with life that you can face anything. This is when it can truly be said that you are emotionally intelligent, and you are likely to experience a high level of happiness and inner calm in your life. It is said that humans become the average of the five people they spend most of their time with. This means that if you spend most of your time with those who lack emotionally sobriety, it is very unlikely that you are going to develop this trait yourself. It is important to stick with the winners in recovery because these individuals are going to motivate and inspire you. These people are not only going to offer you support, they will also be able to share valuable lessons with you. One of the common characteristics of people who are not emotionally sober is self-obsession. These individuals are always thinking about themselves, which can lead to problems like depression. Spending time with others is going to help you get out of your own head. It is also going to teach you some valuable lessons that will allow you to develop emotional sobriety. This type of work is one of the best things you can do to strengthen your recovery.